There's a new Copic marker case in town! The new Copic marker Art Case will hold all 358 Sketch markers, with room for accessories! Any style of Copic hard plastic cases perfectly fit inside this sturdy case. Durable, colorful and portable, it's perfect for taking your collection anywhere! Until I have a need to transport all of my marker collection to use somewhere (like maybe our whole house move next month! ), I am currently using this sturdy case to house my extra Copic supplies -- Seven different hard cases full of extra/class Sketch markers, special edition Sketch marker set, extra Glue Markers, Colorless Blender solution, and a 72-marker wallet . . .
And I still have room for more! It is very nicely constructed, with reinforced corners, and sturdy! Are you like me and always have good intentions on mailing out birthday cards on time, but life gets in the way? Then I have the perfect card for you today and this sweet Taylored Expressions Shooting Stars stamp set has the perfect sentiments! I hope you'll join me today over on the Taylored Expressions blog for all the details! Essentials by Ellen Winter 2016 Release! I started by gold heat embossing the flowers onto watercolor paper and then simply filled a water brush with Copic Colorless Blender and used it to pick up the Various Ink Refill color from a palette to "water"color with! Did you know Various Inks are computer matched from batch to batch, to guarantee a lifetime of consistent color! 1. I started with my darkest green, YG23 Copic Various Ink Refill, and colored the blossoms in the background or anywhere I wanted a darker green. 3. Moving on to my pinks, I used lighter RV52 for the lighter pinks, leaving some areas of the pink flowers still uncolored. 4. Next, I used lighter YG01 to color some parts of the pink flowers. This mixture created a pretty coral color! To finish the card, I stamped and gold heat embossed the beautiful "Thinking of you" sentiment that is included in this stamp set on the lower part of the card. A 1/4-inch section was cut out of the card front, above the sentiment, and colored with Copic RV55 marker to match the flower centers. Then I die cut the pretty Bed of Roses from this paper. As with any intricate die such as this, I always use a metal adaptor plate in my die cutting sandwich, to ensure good clean cuts. Next, I die cut Bazzill Gummy Bear (purple) cardstock with a Taylored Expressions Stitched Banner Stacklet and white heat embossed the "you are" sentiment from the new Totally Awesome stamp set. Finally, the Brushstroke Wonderful die was used to die cut gold glitter paper and the word added to the banner. 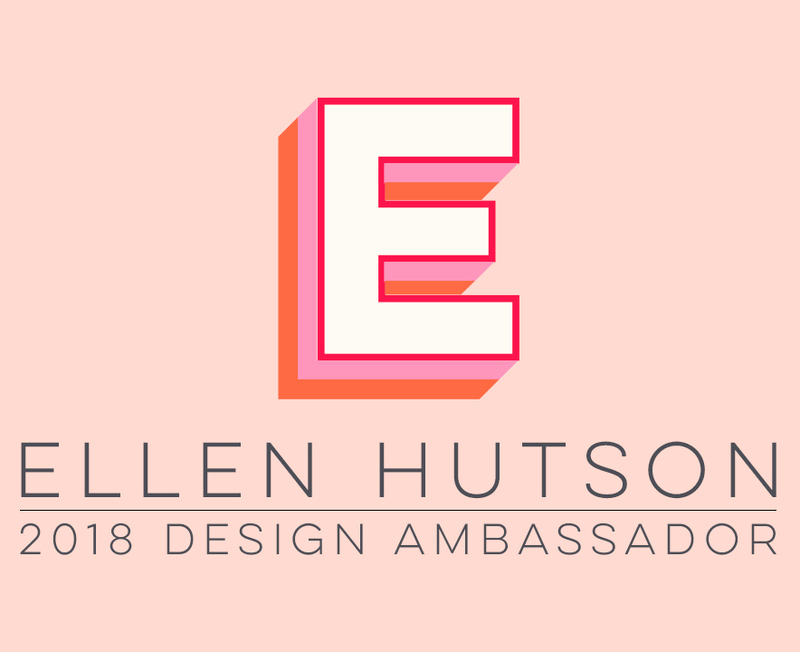 The kind folks at Ellen Hutson LLC are sponsoring a giveaway of an Essentials by Ellen stamp set to one of my lucky blog readers! The winner may chose ANY Essentials by Ellen brand stamp set (maximum value $15) currently in stock at EllenHutson.com! To enter my giveaway, please leave a comment on this post by February 16th! There is also a crazy awesome Grand Giveaway in the CLASSroom! To enter, be sure to leave a comment THERE, also by February 16th. ALL winners will posted at the CLASSroom on Friday, February 12th! You should have arrived here at my blog from Kelly Griglione’s blog, Notable Nest. The next stop on the hop is Amy Lee‘s blog, the craft bunny. If you get lost along the way, please visit the CLASSroom blog for a complete list of all the designers and blogs. Today over in Ellen Hutson's the CLASSroom I'm sharing a sneak peek of a new upcoming Essentials by Ellen stamp and die release ... I hope you'll join me there for all details of this sweet bear card! And we hope you will join us next Tues, Feb. 9 for the release blog hop we have scheduled for you!